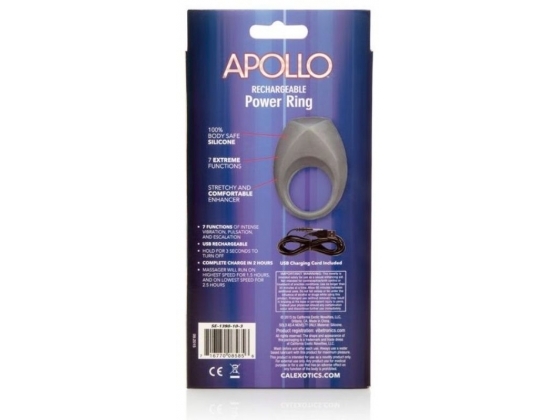 The Apollo® Rechargeable Power Ring, made from soft, stretchy, comfortable silicone is an enhancer ring that provides 7 intense functions of vibration, pulsation and escalation. For a thrilling, sensual experience, this USB rechargeable ring - charging cord included - can’t be beat. Our rechargeable erection enhancer is a durable stimulator adding support and stimulation for you and your partner. Intensify your gratification in the utmost comfort. And, increase your stamina withthis vibrating enhancer, designed with the highest quality for pleasure and safety. The all-silicone ring lets you sustain your erection comfortably, and send you on your way to a more exciting experience. Sleek styling, and a comfortable fit: this erection enhancerhas what you need for a more thrilling sensual experience. Get ready, get set, and stay going longer - stay harder, and stronger, longer.